There are three standard types of patio doors – bi folding, sliding and French doors. Additionally, there’s a newer style of contemporary door system which combines sliding, pivot opening and stacking. One advantage of bi folding doors over sliding doors is that, unless the sliding doors retract into a wall (“pocket” doors), bi folds enable a much wider opening access. Similarly, a set of French doors is restrictive, a maximum of less than two metres compared with a 7m opening with bi fold doors. How does this compare with the new wave of modern doors? 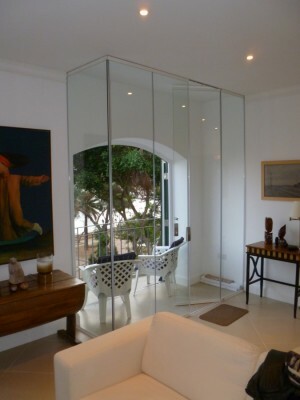 A handful of manufacturers supply the UK market with Frameless Glass Doors. If you are considering whether to install these as patio doors or doors to/from a conservatory, check with your local planning department first. Most Frameless Glass Doors are tempered glass and unsuitable for external walls, as they will not meet minimum requirements regarding thermal insulation values – by a long way! They are excellent as internal room dividers, enclosures for covered terraces, out-buildings and commercial premises (where different regulations apply). If the frameless system is unsuitable, there are two alternatives that provide a minimalist solution. UltraSlim “hingeless bifolds” or Sightline doors – both with side frames of less than 2cm. UltraSlim doors look similar to our slimline bi folding doors yet more sleek. They are fully retractable to stack at the side of the opening, providing more access space as their profiles are narrower, as there are no hinges. They work on the same principle as Frameless Glass Doors except that they are double-glazed and conform to standard building regulations. Alternatively, if you have a very wide aperture, up to 12 metres, a pair of Sightline sliding doors will enable up to 6m access – with the added advantage of only a single sightline of under 4cm in the centre of the glass doors, when closed. Which will you choose? Contact us with your questions or for a comparative quotation.